This article is about Richter's appearances in Super Smash Bros. Ultimate. For the characters in other contexts, see Richter Belmont. 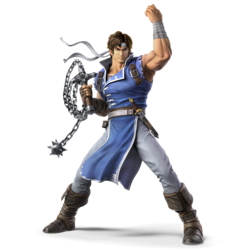 Richter (リヒター, Richter) is a playable character in Super Smash Bros. Ultimate. He was announced as a newcomer alongside Simon, Chrom, Dark Samus, and King K. Rool during a Nintendo Direct on August 8th, 2018. He is an Echo Fighter of Simon, though the two of them actually take inspiration from each other. Richter is classified as fighter #66ε. Richter is voiced in English by David Vincent, his recurring voice actor from Castlevania: Dracula X Chronicles onward, who initially confirmed on Twitter. He is voiced in Japanese by Kiyoyuki Yanada, his voice actor from Symphony of the Night onward. Play VS. matches, with Richter being the 35th character to be unlocked. Clear Classic Mode with Link or any character in his unlock tree, being the seventh character unlocked after Young Link. Have Richter join the player's party in World of Light. With the exception of the third method, Richter must then be defeated on Dracula's Castle. Richter is a moderately heavy fighter who has a lackluster recovery and mobility, but makes up for those shortcomings with a handful of effective projectiles and incredibly long disjointed attacks. One of Richter's most notable traits are his notorious projectiles. Firstly, Axe is a very strong projectile that can be thrown in three directions, which makes it effective at both edge-guarding and a threatening anti-air option, compounded by its ability to go through solid terrain. His side special, the Cross, functions like a boomerang, though unlike other boomerang projectiles, it does not follow Richter, instead going straight and then briefly going backwards on it’s own if not grabbed by Richter; in addition to this, it sends opponents vertically in the air with low knockback, which is favorable for setups into aerial attacks, the Axe or an up smash. While his up special, Uppercut makes for a very poor recovery, it is a very fast out-of-shield option with decent kill power with multiple setups into it such as the Cross or more notably, down aerial. Finally, his down special, Holy Water is a great projectile for ledge-trapping, combo setups or kill setups. Richter's other notable trait is his impressive range. His Vampire Killer whip offers the overall longest distance of any fighter in the roster, and it makes his overall kit well-rounded and versatile. In the air, despite his aerial mobility being sluggish, his aerials are effective in their own rights; his up, forward and back aerials all have impressive range and can be used as tether recoveries, along with the latter two having the unique ability to be angled. His down aerial is a notoriously effective combo tool, as it functions much like Greninja's down aerial; it meteor smashes at the beginning, but what makes it versatile is its late hit. On the late hit, both Simon and the opponent will bounce back up at diagonal angles, which opens up many KO confirms, notably into his Uppercut. At low percentages, it can combo into itself multiple times, which can potentially make it a zero-to-death tool if the opponent reacts poorly. Richter's range is also effective on the ground, as his sluggish frame data is compensated by his attacks having immense range and power at the spiked ball at the end of the whip, to the point where they can be considered safe on shield if spaced despite their lag. All of his smash attacks are notable examples of this; his forward smash is very powerful when tippered, and when combined with its ability to be angled, makes it a deadly edgeguarding and ledge-trapping tool. His up smash is very strong when tippered, making it a reliable anti-air tool and a combo finisher and KO confirm out of his Cross. His down smash hits on both sides like most others, and keeps his trademark range and has decent power when sweetspotted. Richter’s grab game is also decently effective. His forward and back throws have good KO potential despite their rather quick speed, and can be used to set up edgeguards otherwise. His up throw is considered to be his most useful throw, as its decent damage is compounded with its great setup ability, being able to start juggles. His down throw is rather situational and is his least used throw, but nevertheless has combo potential thanks to Richter's good range. Despite all these strengths, Richter has some very noteworthy weaknesses. Perhaps his most infamous shortcoming is his extremely poor recovery, being among the worst in the game; his very low air movement, combined with Uppercut offering very poor vertical and horizontal momentum, give him very poor offstage presence. While he can use three of his aerials as a tether recovery, he is more easily gimped compared to other characters with tether recoveries, like Lucas and Zero Suit Samus, because compared to Richter, they have much better aerial mobility and options to mix up their recovery. Richter, on the other hand, has the worst air acceleration in the game and among the slowest air speeds, which gives him overall a small chance to get back to the ledge. Despite Richter's zoning and spacing potential, it is overall burdened by his poor frame data, overall lackluster mobility, and his status as a rather tall heavyweight. His poor mobility makes him vulnerable to zoning and pressure, and while he has his projectiles, they each have noticeable startup and are susceptible to being reflected back, which can be a huge turnabout especially because the projectiles play a huge role in Richter's neutral game. His poor frame data also gives him a mediocre close-range game, as many of his attacks are unsafe if not spaced, and often leaves him heavily susceptible to punishment. This is further compounded with his susceptibility to combos due to his tall stature, heavy weight and poor frame data, preventing him from easily getting out of combos. Overall, Richter is fighter who excels when he is distanced from his opponent and controlling the main stage: he should use his variety of projectiles to keep opponents at a workable distance, all while avoiding getting sent offstage due to his poor offstage survivability. Despite his weaknesses, Richter has been a relatively popular character in Ultimate’s early lifespan, with moderately good results and reputation along with the fighter he echoes, Simon. The only gameplay difference between Richter and Simon is that Richter's Holy Water has an aura effect, as opposed to Simon's Holy Water which has a flame effect, as a result of the blue flames. Because of this, Richter has a slightly better matchup against Olimar (as he can deal damage to Olimar's Red Pikmin, who are immune to flame-based attacks, with Holy Water), while Simon is more favorable in the matchups against Link, Toon Link and Young Link, as he can cause their explosives to forcibly detonate before reaching him. Otherwise, Richter plays and acts identically to Simon, with only his idle animation, taunts and victory animations being different. Choosing one is almost entirely a matter of aesthetic preference. Richter has a slightly different idle animation (though his periodic idle poses are identical) where he moves more, appearing more impatient while standing. This does not apply when he is holding a light item. As with all Echo Fighters, Richter has different taunts and victory animations. Richter's Holy Water emits blue flames, and is an aura attack unlike Simon's flame-based version. However, its strength does not scale with Richter's damage percentage ,unlike Lucario's aura attacks. This allows Richter to inflict damage to Olimar's Red Pikmin with his Holy Water. However, Richter cannot forcibly detonate certain explosives (such as Remote Bomb Runes or Young Link and Toon Link's Bombs) with his attack. Cross deals less shield damage. Specific Grand Cross parameters have been adjusted, making them identical to Simon's variant. Richter's whip, the Vampire Killer, possesses a sweetspot at the tip of the chain where the spiked ball is. Richter's forward aerial, back aerial, and up aerial all act as tether recoveries, allowing them to be used for recovery but also cancels the attacking part of the move while it is in progress. 2% Swings the Vampire Killer twice while holding it lengthwise, with his left hand holding its chain. Mashing the attack button quickly will cause Richter to rapidly spin the whip to damage opponents, with a final uppercut that sends opponents away. If not done quickly enough, Richter will cancel the first two hits, ending the attack and leaving him vulnerable. This move is Richter's fastest option up close. If the attack button is held down instead, Richter will hold out the Vampire Killer, and it can then be manually twirled around. This attack is based on Simon's Whip Twirl from Super Castlevania IV (and was also used by Richter himself in Symphony of the Night), and it is functionally similar to Sheik's Chain in Melee and Brawl. The chain deals minor damage in this way, but can cancel very weak projectiles that collide with it. The spiked ball of the chain is its sweetspot, which deals more damage and sends opponents away. 12% (spiked ball), 10% (chain) The iconic whip strike from the original Castlevania. It has high range for its speed, and low ending lag. This makes it useful for general spacing. However, only the initial whip lash deals damage, and opponents can crouch under it. The tip of the chain deals more damage, and can KO at around 120% at the edge of Final Destination. If the attack button is held, Richter will transition into the Whip Twirl, identical to his held neutral attack. 10% (whip), 2% (close) A quick whip twirl in a lasso-like fashion that covers above his head. The earliest hitbox starts slightly above Richter's face, and moves left and right once. Provides excellent coverage above Richter, granting it good pressuring capabilities against aerial opponents. It can also potentially chain into itself more than once at low percents. However, it has no grounded hitboxes beside him whatsoever, making it risky against grounded opponents. The move also has a very weak hitbox when the chain first comes out, though it has no typical use. Sliding 5% (hit 1), 7% (hit 2), 3.5% (hit 2, late) A slide kick based on his Slide and Jumping Slide abilities from Castlevania: Symphony of the Night. The first hit is incapable of KOing even at 999%, but if the button is pressed again, Richter does a jumping kick that carries his momentum, comboing from the first hit. The jump deals less damage late, and is capable of jumping off platforms and edges. The first hit allows Richter to slide under projectiles or high hitboxes. The second hit can KO beginning at 140% from the edge of Final Destination. 1.7% (hits 1-5), 3.5% (end) A dashing attack while twirling the Vampire Killer beside himself. Based on his Blade Dash from Symphony of the Night. The dash covers half of Final Destination. Capable of destroying weak projectiles, but extremely damaged opponents may be knocked out before the final hit. The move is also one of the few attacks that can still cross-up in Ultimate. 18% (spiked ball), 16% (chain), 14% (chain, close) Rears back before performing a long-ranged whip crack while taking a step forward. Can be angled. Has tremendous reach, being the longest non-projectile forward smash in the game (outperforming Corrin, Mii Gunner, and Shulk). Deals the most damage at the tip of the chain, and less when up close. The sweetspot can KO as early as 57% from the edge of Final Destination, is safe on shield due to its sheer distance, and deals respectable damage to shields. The rest of the move is punishable on shield, and opponents can crouch under the chain. If angled down, the sweetspot can hit ledge hanging opponents. 16% (spiked ball), 14% (chain) A vertical whip crack. It has immense vertical range, but its hitbox is incapable of hitting anyone directly beside Richter or the chain. Due to its high ending lag, this makes the move suited solely for aerial targets. While hard to hit, the sweetspot can KO as early as 67% on Final Destination. It can combo from up throw at 0-30%, though opponents can DI away from this. 16% (spiked ball), 14% (chain), 12% (chain, close) Drags the Vampire Killer across the ground from forward to back. Impressive overall range like his other smash attacks, and also deals less damage up close in a similar fashion. Both hits do the same amount of damage, with the first hit being rather fast. The sweetspot KOs as early as 85% from the edge of Final Destination. If not sweetspotted, the move is punishable. 1% (hits 1-6), 4% (end) Twirls the Vampire Killer around his body. Lacks the range of his usual moves, but deals multiple hits and can protect Richter from being pursued aerially. Has slightly deceptive range due to the twirling graphic, and only covers one character length around him. The looping hits send at the autolink angle, allowing a falling neutral aerial to combo into a grab, neutral attack, or other moves. 12% (spiked ball), 10% (chain), 2% (body) Rears back and performs a long-ranged whip crack. It can be angled slightly upward and downward at roughly a 20 degree angle; if angled down, the move can hit grounded opponents. Excellent range, allowing it to hit distant targets easily. However, the hitboxes are slim and have a short duration, while the move has some startup, requiring precise use. Has low ending lag, allowing Richter to double jump and perform another aerial if done from a short hop. Also can be used as a tether recovery, which is useful as Richter has no horizontal recovery options otherwise. The sweetspot can KO from 125% at the edge of Final Destination. 12% (spiked ball), 10% (chain), 2% (body) Rears back and performs a long-ranged whip crack behind himself. Identical damage, properties and usage as forward aerial, and can also be aimed up and down. Like forward aerial, Richter can double jump and perform another aerial if done from a short hop, and it also acts as a tether recovery. Has more knockback growth despite the similar damage, with the sweetspot KOing from 110% at the edge of Final Destination. 12% (spiked ball), 10% (chain), 2% (body) Rears back and performs a long-ranged whip crack directly above him. Functionally identical to forward and back aerials in all aspects apart from attack direction and the inability to be angled. Like forward and up aerials, Richter can double jump and perform another aerial if done from a short hop, and it also acts as a tether recovery, covering around the same distance as Uppercut. The sweetspot KOs from 100% while in the air. 12%, 7% (late) A stall-then-fall divekick, based on the ability both Simon and Richter can obtain in Castlevania: Harmony of Despair. Goes downward at a diagonal angle, with the early frames being a meteor smash. If hit, Richter will bounce back with a flourish, which can combo into other attacks: the early hit easily combos into forward or back aerials at medium percents, Uppercut at 100% or above as a KO combo, or even into itself at low percents. — Reaches with his left arm. Notably, while Richter can use his whip as a tether recovery, he does not use it to grab opponents. 7% Spins once and flings the opponent forward. If the opponent misses a tech, it can be followed up with forward smash, forward tilt or dash attack at 0%. Tech rolls can be caught with Axe. Richter's strongest throw, capable of KO'ing from 125% at the edge of Final Destination. 7% Flings the opponent backwards with both arms. Has the same combos as forward throw, but it is weaker for KOing, as it does so from 145% at the edge of Final Destination. 6% (hit 1), 4% (hit 2) Heaves the opponent into the air before lashing at them with the Vampire Killer. One of Richter's most useful throws due to its setup ability and damage, being the most damaging throw in his moveset. Can initiate combos at 0% such as into up smash, or start aerial juggles. At higher percents, it can set up into up aerial for a KO. 8% A chokeslam. Like forward and back throws, it can follow up with forward smash or forward tilt at 0%, or cover tech rolls with Axe. 7% Kicks behind, then in front of himself. 5% Kicks behind, then in front of himself. 9% Kicks forward while getting up. Axe 15% Throws an axe projectile that travels at a high parabolic arc. The angle can be changed by holding forward or back before throwing. Richter's aerial momentum is stopped once he throws the axe. Extremely high startup lag, with the axe's angle making it ineffective to use conventionally. However, it deals high damage and knockback while also going through solid terrain, giving it powerful edgeguarding capabilities. Its high freeze frames also give it very limited followup ability. The axe can KO grounded opponents from 140% on Final Destination. Cross 6%, 8% (smash thrown), 5% (returning) Flings a silver cross projectile that functions similarly to Boomerang, including the ability to be smash-thrown to fly further and deal more damage. Unlike Boomerang, the Cross makes no attempt to return to Richter, and only flies straight forward and back. The Cross reaches the edge of Final Destination if thrown from the middle, and will travel to the other edge if left uncaught. Only one Cross can be out, and Richter can catch it upon returning. This is generally Richter's main stage-control tool to interrupt approaches and initiate combos. Richter may say "Go!" when performing the attack. Uppercut 2% (hit 1), 1.5% (hit 2-5), 6% (hit 6) A rising uppercut with the Vampire Killer in hand. Richter's main recovery move, though its poor height and Richter's limited air mobility makes it difficult to use as a recovery. Functions better as an attack, as it starts up quickly, can punish aerial opponents, and combos reliably from down aerial. KOs rather late on the ground, though it can KO much earlier as an aerial combo finisher as early as 120%. However, it has significantly lower range compared to Richter's other attacks. Holy Water 2.9% (flask), 1.3% (flames, hits 1-8) Drops a flask of Holy Water diagonally downwards. Once it hits the ground or an opponent, the flask bursts and unleashes a pillar of blue flames. Only one flask or pillar of flame can exist at one time. If the flask is caught, it will become an item that opponents can use against Richter. It can also be reflected or perfect shielded to affect the Richter who threw it. Has similar functionality as PK Fire, keeping opponents trapped within the projectile and in position for a followup, and lacks a final stronger hit. Richter will say "Take this!" when performing the move unlike Simon who simply grunts. This is the only functionally different attack Richter has compared to Simon's; Richter's version does not deal flame damage, which is due to it using blue "fire" particles as opposed to Simon's red ones. Instead, it deals aura damage, but its damage output does not scale with Richter's damage percentage unlike any of Lucario's aura-based moves. Grand Cross 3% (trapping hit), 10% (final hit) Summons a large coffin in front of him, which traps opponents that touch it the moment it appears. If successful, Richter grabs the coffin with the Vampire Killer's chain, swings it in a wide arc and hauls it skywards, then unleashes the devastating Grand Cross technique while flexing, blasting the coffin with crosses made of light, and sending the victims flying. Extremely powerful, able to KO as early as 25%. Appears onstage surrounded by rays of light, and cracks the Vampire Killer before coiling it. Up taunt: Raises his hand in the air with an open palm, referencing his Grand Cross in the opening of Rondo of Blood, leading into the pose from his render while saying "It's time!" Side taunt: Pulls out his whip and straightens the chain, a reference to a piece of artwork shown in the official guide for Rondo of Blood. Down taunt:Tightens his glove while saying "Prepare yourself!". Stands upright with his right hand on his hip. Based on his conversation stance in Castlevania: Symphony of the Night. Richter's idle stance is based on his idle from Castlevania: Rondo of Blood, as well as every preceding Belmont since the original Castlevania. Whilst spinning, Richter swings the Vampire Killer around himself while saying "You don't belong in this world!" before striking the ground with an overhead swing and pulling the chain taut. Jumps and whips the ground. Just before he lands, he spins in a brief clockwise manner. Upon landing, he assumes a pose identical to his official render. While facing away from the camera, he pulls back and rolls up the Vampire Killer, putting it on his side. He then, with his back still facing the camera, turns around, similarly to his idle stance in Symphony of the Night, and makes a parting gesture saying "Farewell!" This is from the cutscene where he rescues Tera in Rondo of Blood. Both the English and Japanese names refer to Echo Fighters, which Richter fights in numerical order. One of two options will be randomly selected for the music that plays during the Final Round. The first option is identical to Simon's route: Nothing to Lose plays during the first phase, and Black Night plays during in the second phase. The second option is that Dance of Illusions plays throughout both phases, referencing how Rondo of Blood has the song play through both stages of Dracula's fight. Although Richter does not appear in the World of Light opening cutscene, he was vaporized and later imprisoned alongside the rest of the fighters (sans Kirby) when Galeem unleashed his beams of light. Richter was one of the many fighters that fell under Dharkon's control upon Galeem's first defeat. He is in the Dracula's Castle sub-area, but only makes an appearance if the player manages to destroy all the purple evil ghosts that teleport the player if touched with the use of cannonballs. If the player manages to do so, he'll appear in between the spaces for Alucard and Dracula. Richter's Fighter Spirit can be obtained by completing Classic Mode. It is also available periodically for purchase in the shop for 500 coins. Unlocking Richter in World of Light allows the player to preview the spirit below in the Spirit List under the name "???". As a Fighter Spirit, it cannot be used in Spirit Battles and is purely aesthetic. Each Fighter Spirit has an alternate version that replaces them with their artwork in Ultimate. Simon and Richter artwork, as posted on the official Japanese Konami Twitter account. Richter straightening his whip on the Bridge of Eldin. Performing his down tilt on Kalos Pokémon League. Richter pummeling Lucas on Skyloft. Holding a Lip's Stick next to a Red Pikmin on Distant Planet. In his red alternate costume on Yoshi's Story. Richter posing next to Simon on Coliseum. According to Sakurai from a Nintendo Dream Magazine interview, Richter was added in due to the Smash Bros Fighter Ballot. Richter is one of the only three full clones in the series to not have any significant gameplay differences from their base characters, the others being Daisy and Dark Samus. With the playable appearance of Richter and Simon, Castlevania was the first third-party franchise to have more than one playable representative. Richter is the first third-party Echo Fighter, and the first full clone to debut in the same game as their base character since Roy in Super Smash Bros. Melee, with the first being Luigi in Super Smash Bros.
Richter's render is based on the boxart for Rondo of Blood, modified to face forward rather than straight up. His line in the English trailer delivered at Dracula, "Begone! You don't belong in this world, monster! ", is a reference to the prologue of the original English release of Symphony of the Night, which became infamous for its over-the-top writing and poor voice acting. The first line Richter delivers is "Die monster. You don't belong in this world!". Richter's red outfit is a reference to a character that was cut from Rondo of Blood, often mistaken for appearing in a cancelled Castlevania project for the Sega 32X. Said character used a modified version of Richter's sprite from Rondo of Blood. It also resembles Christopher Belmont as he appeared in the WiiWare title Castlevania: The Adventure ReBirth. When Richter's Smash Blog article was uploaded on August 12th, 2018, Richter's name was erroneously labeled as "RICHITER" in English variants of his fighter page. The typo was later corrected. This is not the first time this misspelling has appeared. Castlevania: Portrait of Ruin had a similar error whenever a save file is in Richter Mode. Like King Dedede, Lucina, King K. Rool, and Simon, Richter's name is pronounced differently between the different international versions of Ultimate. It is pronounced with a short i, hard k and r in English ("Richter"), while using a long e, h and a in Japanese ("Reehtah"). Richter is the only playable character whose first game appeared on the TurboGrafx-16, known as the PC Engine in Japan. He is also one of the only playable characters who made an appearance on the console, alongside Ryu, Ken, and Pac-Man. Richter and Ken are the only Echo Fighter newcomers with a CGI trailer as well as the only ones with CGI footage for their splash art. Daisy did not have either, while Chrom and Dark Samus had only gameplay footage for their trailers and their official artwork for their splash arts. Richter is the only Echo Fighter to be based off of a character introduced in Ultimate. When Richter is asleep, he will mutter "Dracula..." as he dozes. This makes him the only character to speak while asleep. However, because the clip loops before "Dracula..." is heard in-game, this can only be heard in the sound test. Richter is one of the few characters to speak during a KO: his alternate KO line has him yell "Why?!". Richter is the only Echo Fighter that can crawl. Richter's Fighter Spirit is based off of his Dracula X Chronicles design, as opposed to his Rondo of Blood design used for his actual character model. Richter is the second character to utilize aura in his moves (his version of Holy Water), with Lucario being the first. Unlike Lucario, Richter's damage doesn't affect the strength of Holy Water. Richter is unlockable in Link's Classic Mode column. This means he can be unlocked if the player completes Classic Mode as Simon or Snake, both of which are Konami characters. In the gameplay sections of the Belmonts' reveal trailer, Simon and Richter are facing and attacking to the right for most of the scenes. This could be a possible reference to Castlevania's left-to-right style of progress throughout levels. This page was last edited on April 19, 2019, at 17:56.